Looking for a unit exam that incorporates vocabulary, student-created examples, and critical thinking? This Foundations of Economics unit test contains 25 multiple choice questions and 5 free response questions (several have multiple parts to them). All materials are available in PDF form and Word form so that you can pull the questions that apply to your class if you so choose. 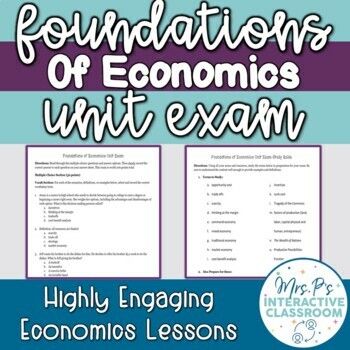 All questions are perfectly aligned with my Foundations & Fundamentals Economics Unit Bundle and is included in that bundle. Sample of Topics Covered: opportunity cost, tradeoffs, sunk cost, incentives, types of economies, factors of production, production possibilities frontier, and excerpts from Adam Smith's Wealth of Nations.